All first-year students at UCF read Zora Neale Hurston's "Dust Tracks on a Road" as a part of the Common Read program. On a lively summer afternoon in Orlando, Anna Lillios is winding down for the day in Moscow. The UCF professor of English is in the middle of a month-long stay in Russia on a Fulbright-Hays project and, even though it’s bedtime, when she hears that someone back in Central Florida wants to talk about Zora Neale Hurston’s memoir Dust Tracks on a Road, Lillios hits the “on” switch. “The book clicks with people,” she says. It’s why all first-year UCF students will read Dust Tracks as part of the school’s Common Read program, providing a relevant topic for conversations and easing the transition into college life. The book has everything. Education. Friendship. Family. Love. There are struggles, triumphs and humor. It’s impossible to read Dust Tracks and not relate to the topics. I love Hemingway and still teach his work, but… Hurston’s storytelling is just as amazing and is probably read more often today. She connects with people regardless of culture, age, gender or race. Every chapter on her life is about finding one’s unique place in the world, and that’s perfect for incoming college students. Hurston was way ahead of her time. The stories in Dust Tracks touch so many of the positive changes we’re seeing in our culture today, yet it was written more than 70 years ago. In fact, they’re selling far more of her books now than were sold in the 1930s, ’40s and ’50s. 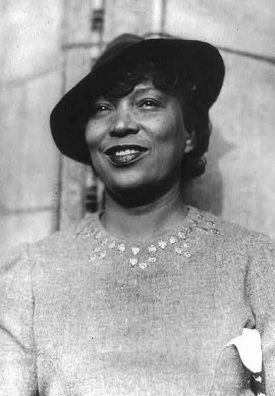 Hurston’s total life earnings from her books were less than $1,000. She obviously didn’t write for the money. People here in Russia love Hurston, too. I introduced Hurston’s books to a Russian professor who was at UCF on a Fulbright 15 years ago. The themes of empowerment hit so close to home that she started to translate Dust Tracks for her university. It made such an impact that she comes for the Zora Neale Hurston Festival in Eatonville every year. Again, it’s proof that the book doesn’t know any boundaries. Eatonville is an amazing community. It’s so rich with culture and history, and it’s all woven into everyday life. Students will see that in the book. And because the town is so close and UCF is a partner for the Festival, students have the great opportunity to experience some of the book’s flavor first-hand. Just think, we don’t have to travel all the way from Russia for that kind of experience. Reading the book is not an academic exercise. I have two sons in their 20s, so I know that young people want to feel connected. We all have our own story. Dust Tracks should inspire students to think of how they’ll tell their personal story — no matter what their background might be. It’s a great way to start the next part of their journey.